From our peaceful spot in the forest near Sisters, we moved about 30 minutes northwest to Suttle Lake. This small, narrow lake has three national forest campgrounds along its southern shore. Each campground offers a handful of first come, first serve sites which put our chances at finding an open site pretty high. After a not so quick detour to use the dump station at the city park in Sisters (the only one around for miles) where the whole place was a madhouse and line for the dump station was at least 6 deep and snaked through the campground roads, we arrived at Suttle Lake around noon and pulled into the first campground, Blue Bay. Here we found six FCFS sites arranged in a separate loop near the boat launch area. Most were unoccupied and one large pull-thru in the corner looked especially nice. Tim would have been happy to simply pull in and park, but I couldn’t help but wonder what treasures awaited us at the other campgrounds. The answer was none. We spent 20 minutes driving around the South Shore and Link Creek campgrounds to only find one or two open sites and none that were any nicer than the first one. Thankfully, our corner site was still open when we got back and we happily pulled in and parked. 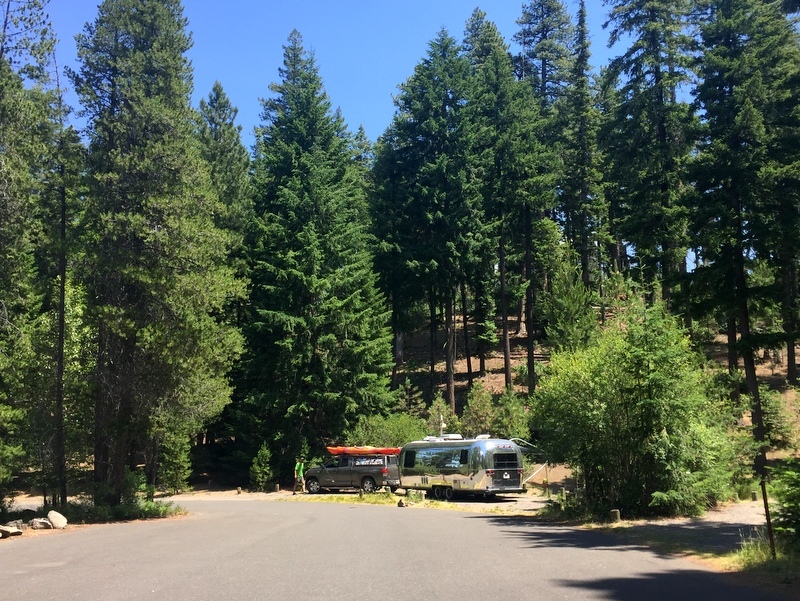 It was going to be a short stay for us — only four nights –so with the truck parked on an awkward angle at the very edge of the site we decided to simply stay hooked up for the duration. After six years with our Hensley hitch, we’ve accepted that sometimes hooking up at an odd angle can be really frustrating. So far we’ve never failed completely, but there have been a few instances when it took us a ridiculous amount of time to disconnect or connect. Unlike our last spot, we had no trees for shade. 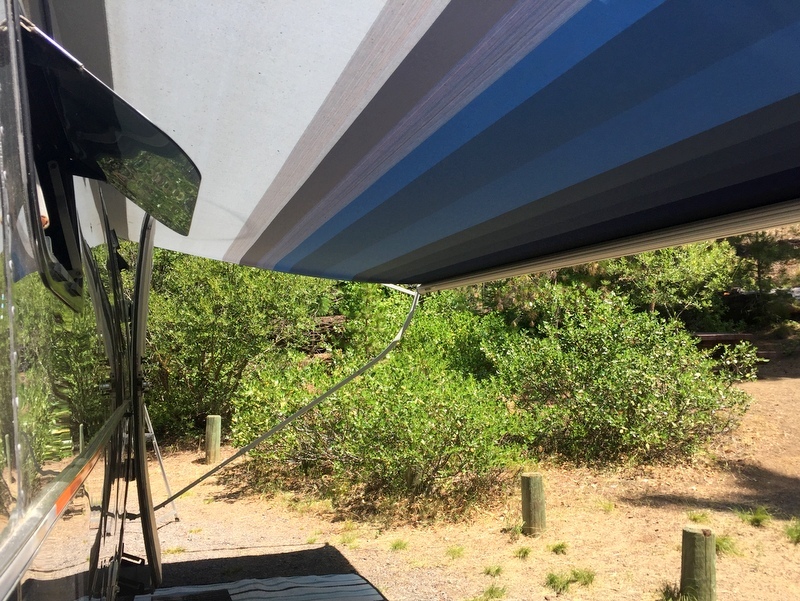 Blue striped awning to the rescue! Despite our self-imposed restriction of on-foot exploration, we easily found enough to keep us busy in or near the campground. 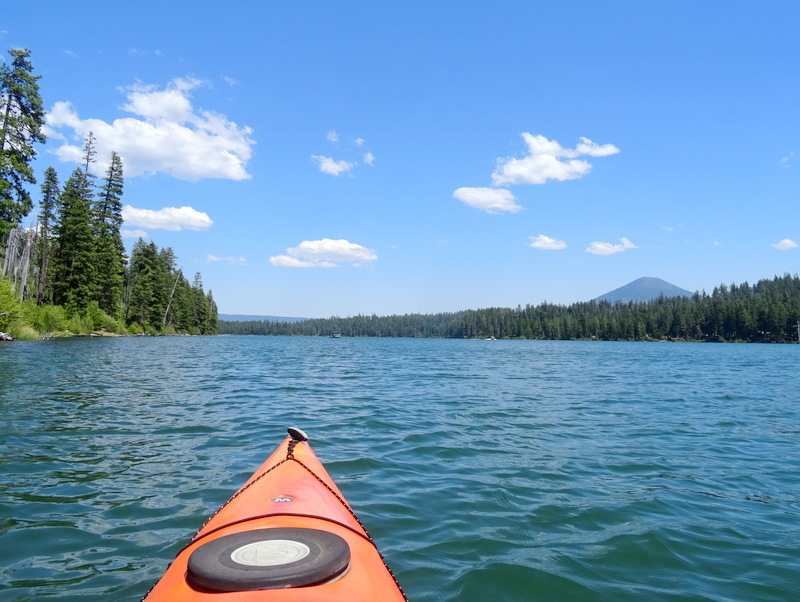 With a lake to paddle and lots of trails to explore it was not a difficult task. We planned to leave on Thursday. Checkout was at 2 pm and Tim still had a few hours of work left so we pulled out of our site and moved about 100′ to the boat launch overflow parking area. In that short distance, the cell signal which had been mostly usable for the last few days (with the booster) totally disappeared. So much for that. With no other options, we simply jumped in the truck and started driving west. A few hours later we were pulling into the Premier RV Resort in Salem. 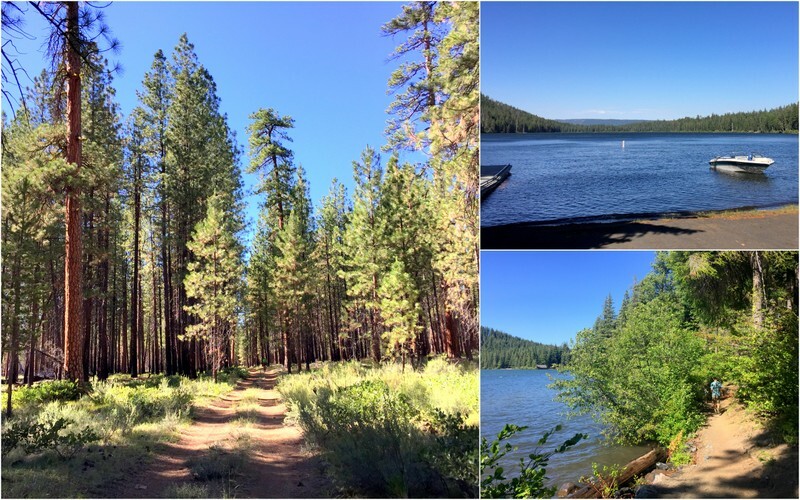 Originally, we had a reservation at Detroit Lake SP for this time, but the need to have some packages delivered, a question about reliable cell service at the lake, and my burning desire to pick berries, led us to make a last minute change. Of course, when we drove past Detroit Lake and saw the gorgeous turquoise water surrounded by mountains, we questioned this choice. Looks like we have another place to add to the list for our next visit to the area. I am usually pretty stingy about handing out praise to RV parks, but our stay at Premiere was about as good as it gets in this category. 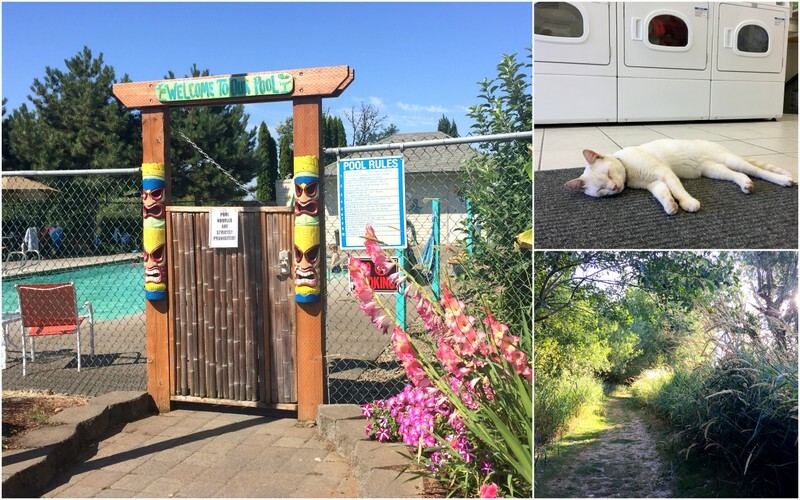 Every part of the park from the laundry room to the between-site landscaping was impeccably maintained. Our pull-thru site had a nice patch of grass along with some tall shrubs and trees between us and the neighbors. While it wasn’t “private” it also didn’t feel like we were parked right on top of the neighbors. The park seems to be comprised of mainly full-time residents and by the end of our week-long stay, we both agreed that if for some reason we needed to stay in Salem for an extended time this would not be a bad spot to call home. It was HOT while we were in Salem and as a result, we spent most of our time inside with the air conditioning blasting. We did visit the pool once (the water was too warm to really be refreshing) and walked the trail around the property one evening, but other than that our stay consisted mostly of running errands and doing projects around the house. 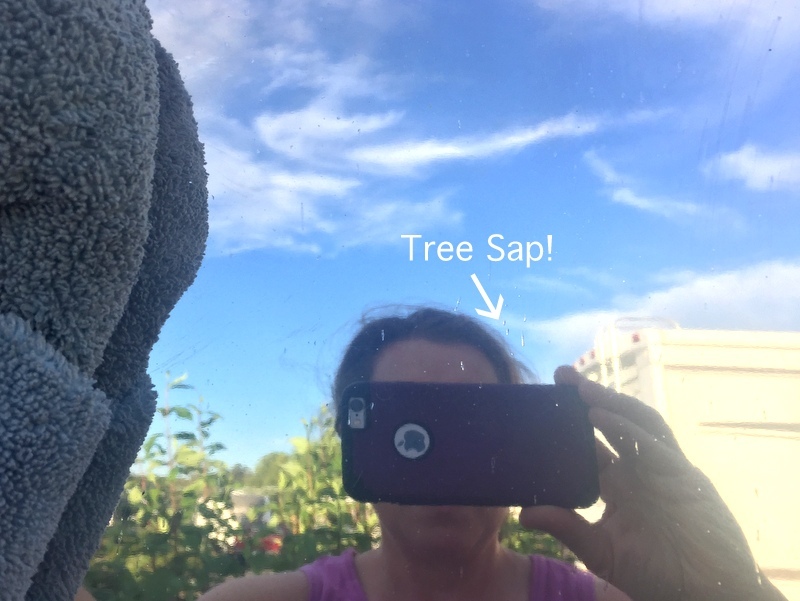 One of those projects was getting rid of the sap that dripped all over the Airstream during our week at Cold Springs and washing months of dirt off the truck. 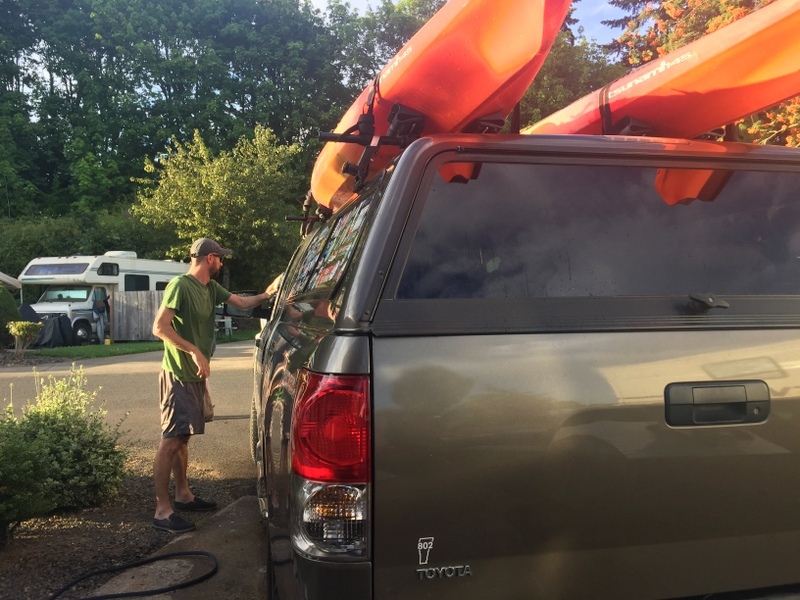 The majority of RV parks don’t allow vehicle washing, but after seeing a neighbor washing his car Tim asked at the office and they said it was not only allowed but encouraged. I suspect this has to do with the massive effort the park puts in to keep the grounds and individual sites looking nice. 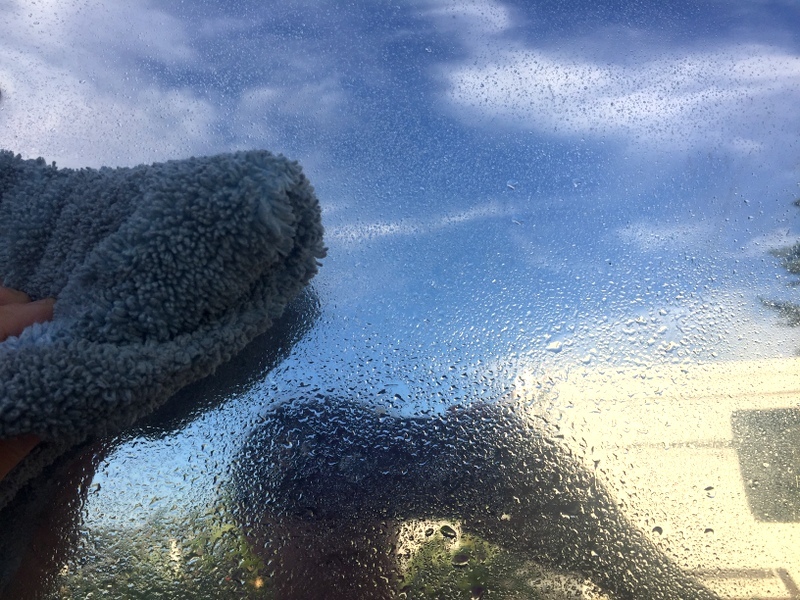 Ever since having the Airstream professionally polished we have instituted a no-washing policy to keep it clean. Sounds strange I know, but one of the major culprits of stains on the raw aluminum is water spots. Since most water is either treated with chemicals or filled with minerals, we now know that every time we washed it, we were only contributing to the issue. So instead of a wash down with the hose, we spray on a mix of distilled water and white vinegar and then very gently wipe it off with an extra soft microfiber cloth. All those little droplets are tree sap. The entire upper third of the Airstream was covered! It’s a bit of work, but the end result is worth the effort and so far we’ve been good about keeping up with the dust/sap/bug removal. It took us most of the week to clean the whole thing since we had to wait until late evening when the hot sun was no longer blazing down directly on us. One afternoon, we left behind the inside cooled air to spend a few hours at the Marion County Fair. We’ve gone to a few of these small town fairs over the years and always find them to be good entertainment. This one was really tiny and very focused on agriculture. 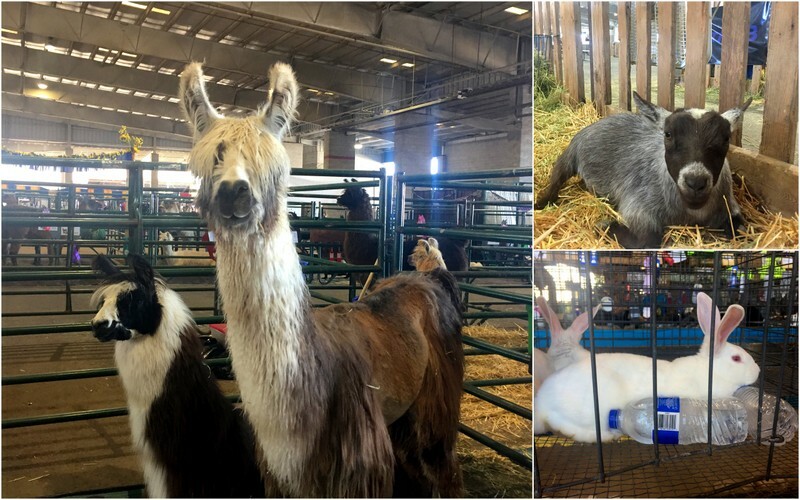 After perusing the craft building and oogling the veggies and flowers set up for judging (oddly enough, this is one of my favorite parts of the county fair) we headed over to check out the animal barns. Judging by the number of goats we saw, I am guessing that goat farming is huge around here. The other outing we took was a trip to a local berry farm for some picking. 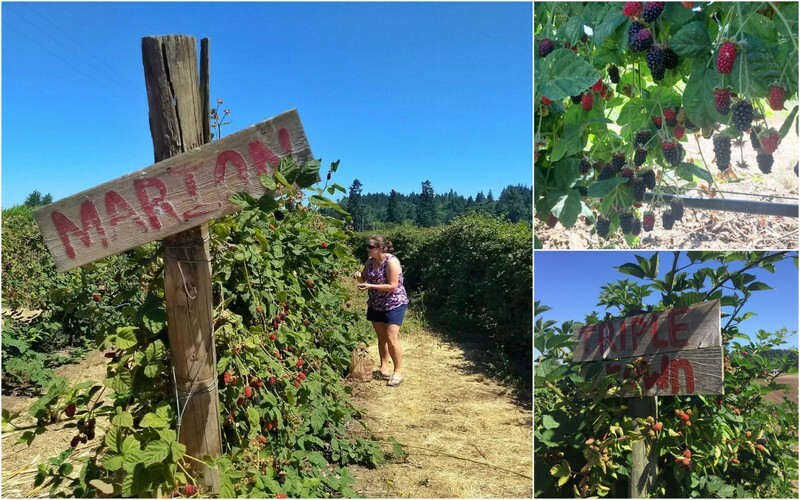 The entire Willamette Valley is known for their berry farms and fruit orchards which means there are tons of pick-your-own farms to choose from. 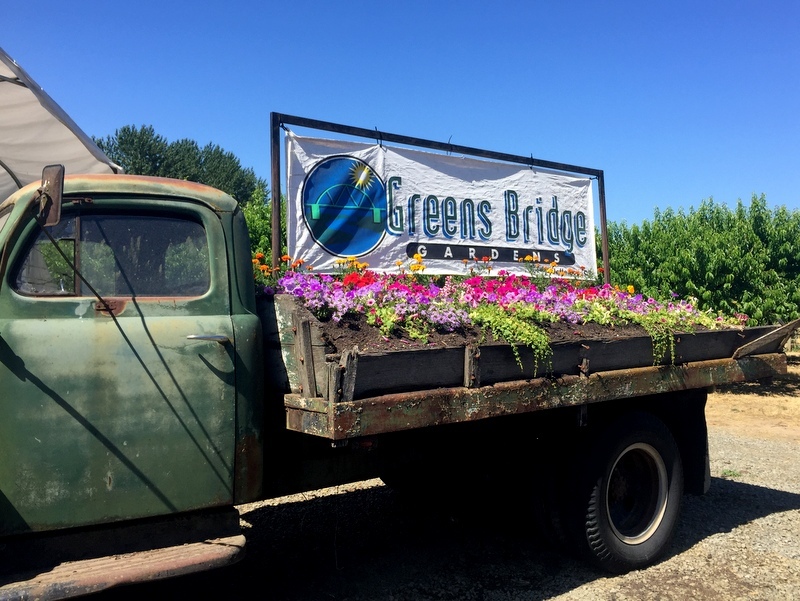 My goal was to pick more than one kind of berry, so when I found Greens Bridge Gardens in nearby Jefferson it sounded like the perfect place. 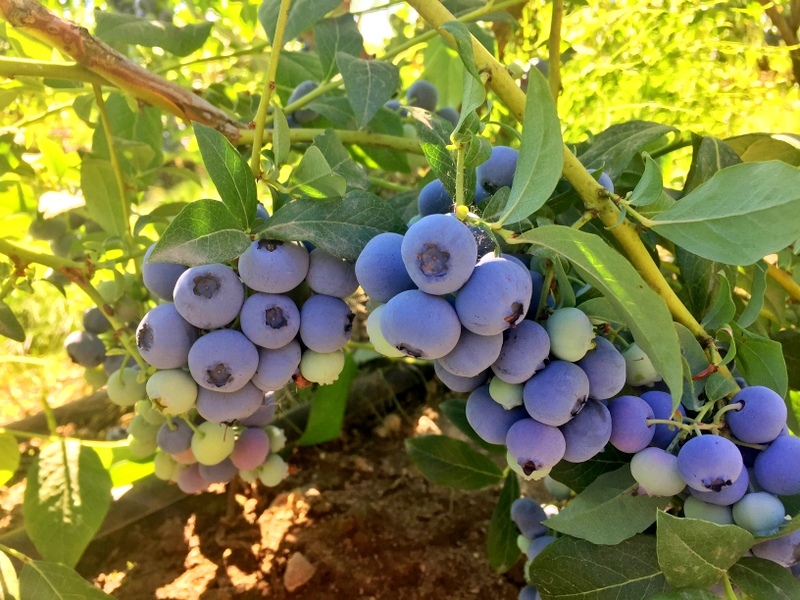 With multiple varieties of berries and other fruit available for u-pick, plus a farm stand full of already picked produce, it’s a great spot if you want to stock up on fresh goodies. 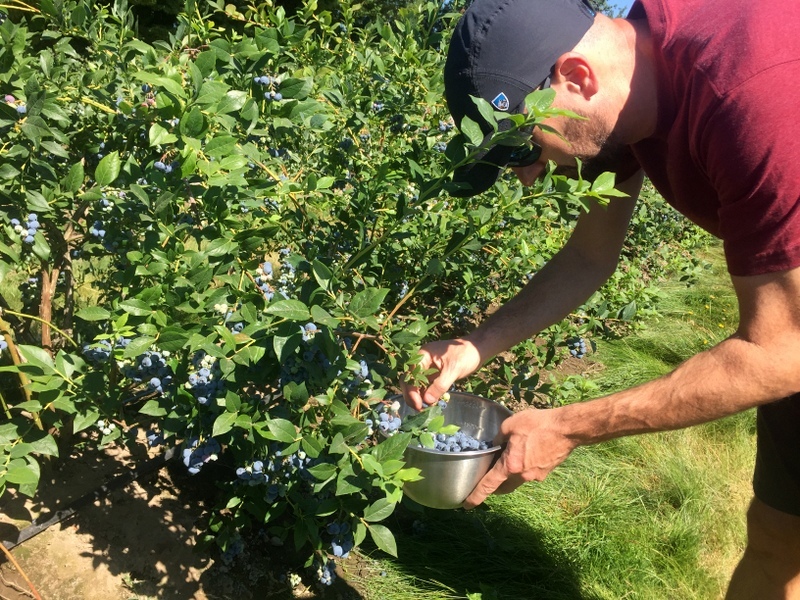 In anticipation of a hot day, we arrived early and started picking blueberries. 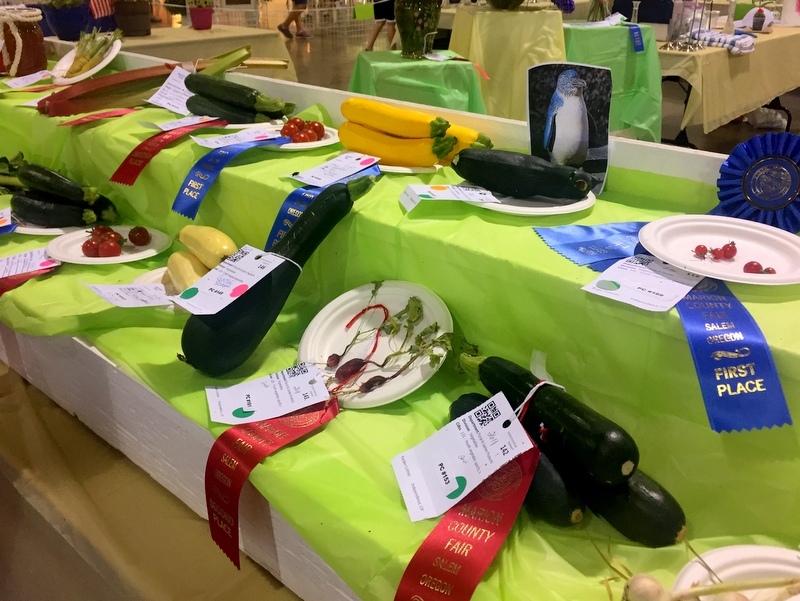 They had four or five varieties that were ripe and bursting with fruit. We picked (and ate) a large amount before moving over to the blackberry patch. All the berry rows were nicely marked and we sampled a few of each variety before deciding which blackberries to pick. I quickly fell in love with the Boysen variety while Tim was enamored of the giant Triple Crowns that were just starting to ripen. 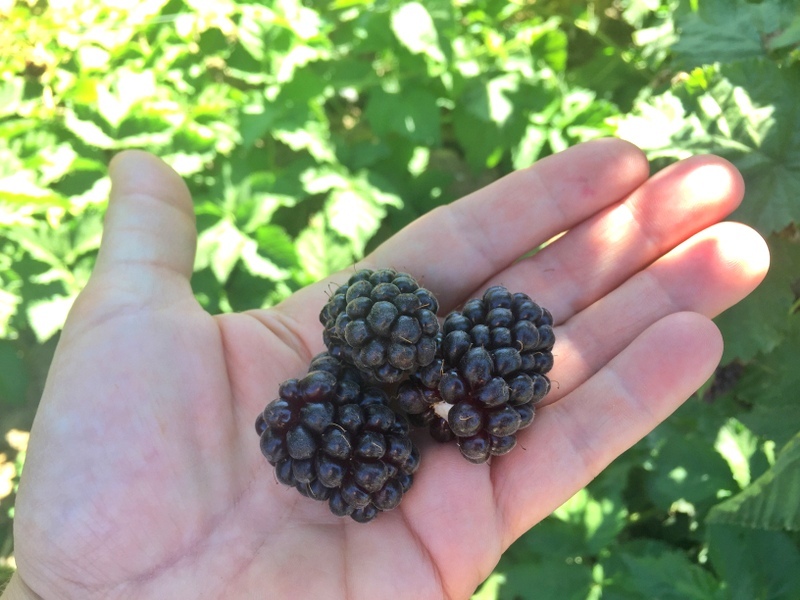 We also picked a bunch of Marionberries, a special blackberry variety that is only grown in Oregon. Back at the farmstand, I picked out a basket of peaches and then had our berries weighed. 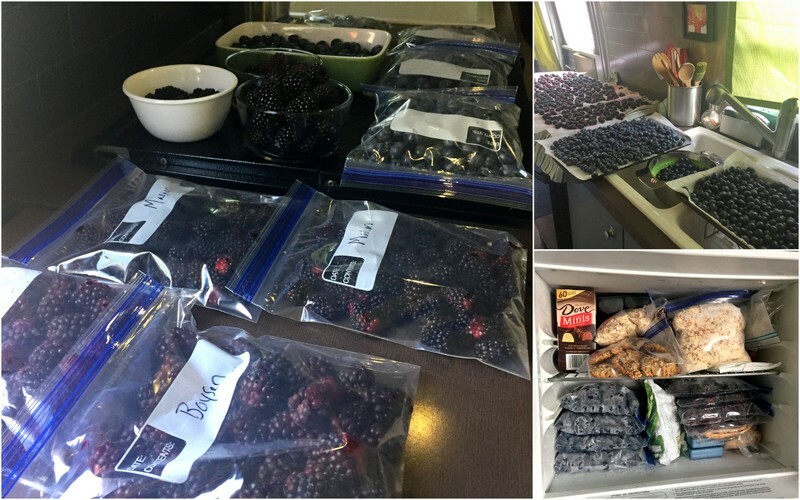 I don’t remember the exact price per pound, but it was a very good deal and we left thrilled with both our picking experience and all those berries we now get to eat. Washing & packaging berries. Eight bags fit in the freezer with plenty of room left for Dove mini ice creams! The final reason we picked Salem as our destination this week was that it was only a 1.5-hour drive from there to a little-known place called Hornings Hideout. This is the location of the annual Northwest String Summit where we were thrilled to be spending the next four days. More on that coming soon! Awesome berries! Looked like there were huckleberries in the market too (my favorite!). I’ve used hand sanitizer with good results on sap, must the the alcohol, but never tried it on pretty shinny aluminium. 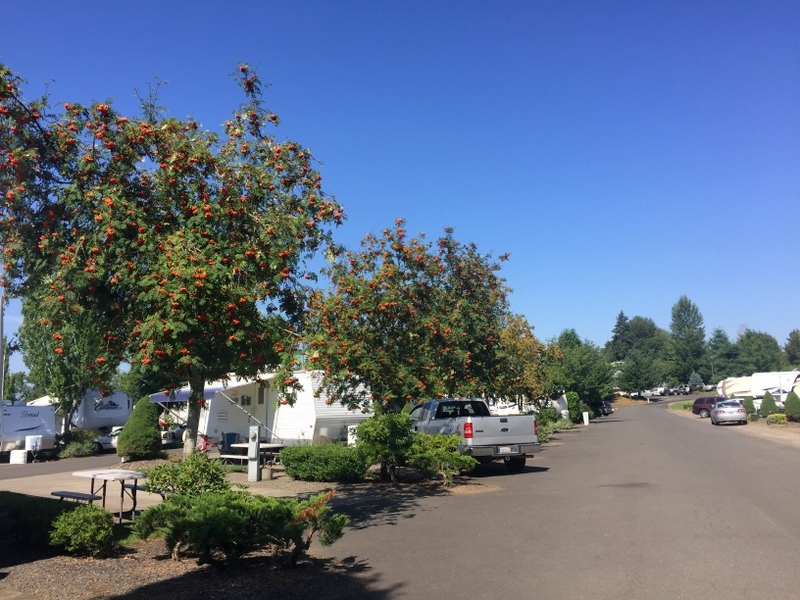 Returning from last year’s eclipse we stayed at Salem RV, right on I-5. A bit of a dumpy little place, but we needed to get out of the smoke and heat. You did much better! Again thanks for the effort put into the blog redesign! Your ‘Travel Map’ is awesome! Hmmm…not sure I’ve ever eaten a huckleberry. Will have to try them out someday. The other product we’ve used to remove sticky stuff from the Airstream is mineral spirits so I can see how hand sanitizer would have a similar effect. 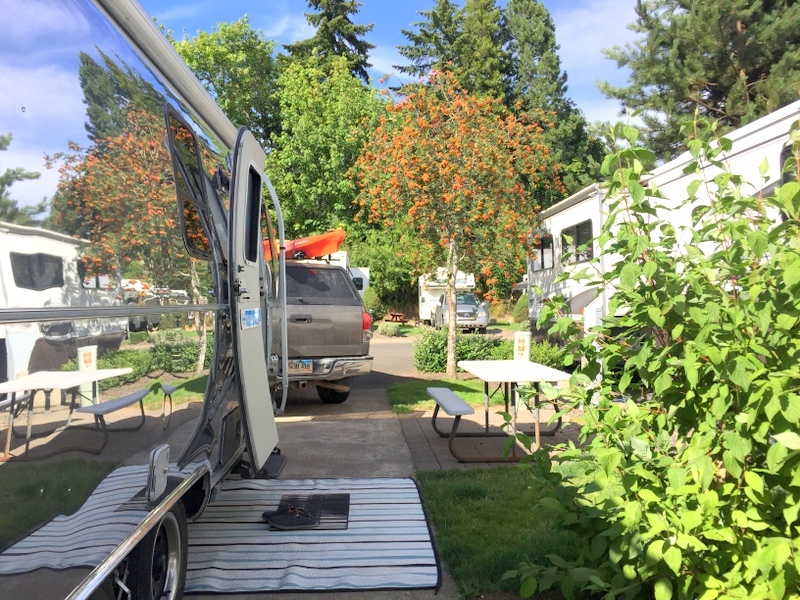 Premier RV is definitely farther from I-5 (about 10 miles) but totally worth it in our opinion. So happy that you are enjoying the new layout and map! It took us a while to figure out the “don’t unhitch” trick, but we eventually realized that sometimes it’s not worth the misery of re-hitching. We have the equalizer hitch and in our case another challenge can be attaching the sway bars. We did eventually learn that in very unlevel sites we can just pull out onto flatter ground (like the dump station) and attach the bars there, but this was a lesson we only learned after many hours of frustration! Thank you once again for keeping it real on the blog! Glad that we’re not the only ones with these hitch issues. Sometimes it feels like we must be doing something wrong and I wonder why we even have this crazy complicated hitch set-up. But then I see other trailers with basic hitch set-ups swaying all over the road while our Airstream never does even in high winds and I am reminded that a little frustration is worth it if it means we are safer! Very sweet corner lot :-) And always nice when you find a park that surprises you and makes you want to return. Our rig is in desperate need of a good cleaning, but not something we’re ready to take on ourselves. Hopefully the next stop we’ll find a place. If our RV was any taller there is no way we would try to clean it ourselves! Even at the top of the ladder on my toes, I can barely reach the roof line. Some things are better left to the professionals. Since I purchased, for about ten dollars, a pair of yellow styrafoam balls with magnetic bases, and three foot telescoping rod, I hook up my trailer by myself and without any frustration. They are amazing. Haven’t had a cross word with the missus since!